Home / Indoor Furniture and Misc / Country Style Collection Furniture Indoors Woodworking Plans for Projects / Country Fresh Nightstand Woodworking Plan. 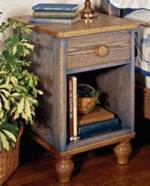 31-MD-00075 - Country Fresh Nightstand Woodworking Plan. Whether built as a stand-alone piece or as a member of our complete Country-Fresh Collection, this oak nightstand offers storage and good looks in the same neat package. And you can choose between country or traditional styling depending on how you decide to finish it. Other members of the Country-Fresh Collection are also available. We used oak and oak plywood but you can use a wood of your choice. A full materials and supplies list is included with the plan. Table saw, drill, clamps, router, hacksaw, and common hand tools.